The armed forces of the National Liberation Front (NLF) were composed both by regular units of the North Vietnam army and by irregulars. 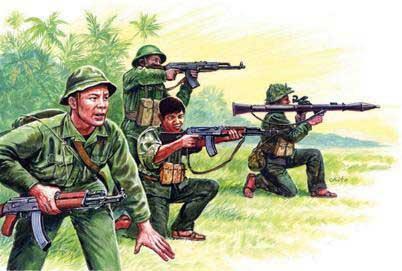 The term “vietcong” was used as a generic term for NLF soldiers, but in common iconography it represents the irregular guerrillas. The vietcong were armed with Soviet-produced weapons like the ubiquitous AK-47 Kalašnikov assault rifle, or the semi-automatic SKS carbine. In January 1968, they took part in the massive Tet Offensive during the night of the Vietnamese New Year.